Looking for a once in a lifetime experience? Stop at Ziwa Rhino Sanctuary to visit the reintroduced white rhino. Have game drives on the large savannah at Murchison Falls National Park and boat trips to the Murchison Falls and the Victoria Nile delta. In the delta there is a fair change to see the strange shoebill. 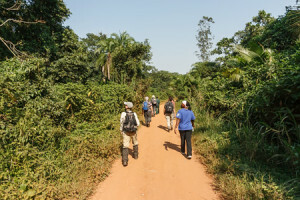 Meet a close relative in Kibale Forest during a chimp walk and see lots of birds and smaller primate species when walking through Bigodi Swamp. Look for lion, leopard and the unique Uganda kob during game drives in Queen Elizabeth National Park. See lots of African buffalo, hippo, bushelephant and other mammals when sailing the Kazinga Channel, but don’t forget to look for birds and large nile crocodiles. Meet a small group of chimpanzees in the untouched Kyambura Gorge and look for tree-climbing lions in the Ishasha Sector. Have a relaxing day at Lake Bunyonyi or rent a canoe and watch for otters and birdlife. Enjoy one of the highlights of this tour: gorilla tracking. Visit the last mountain gorillas in the afromontane forest of Bwindi Impenetrable National Park and spend an hour amongst these gentle giants. Have an extra day to explore Kisoro and surroundings. Spend time at a coffee tour or climb for example Mount Gahinga. Have to complete this great tour several game drives in Lake Mburo and watch for impala, plains zebra, eland antelope and topi, but don’t forget the wide variety of birds. 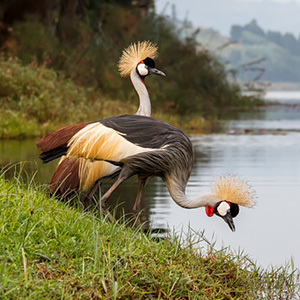 Have a relaxing boat trip on Lake Mburo and look for the elusive African finfoot and wonder yourself about the large numbers of African fish eagle. Spend the night in simple but good accommodation (standard tour) or stay in the best accommodation available (luxury tour). Stay in the famous Travellers Rest Hotel in Kisoro. Transport in our own 4WD Toyota Land Cruisers with pop up roof, adapted for optimal visibility during game drives. Travel in small groups (6-12 people) with a window seat for everyone in the Land Cruiser. Guaranteed to visit the mountain gorillas in Uganda and / or Rwanda (gorilla permit not included). Chimp tracking in Kibale National Park and Kyambura Gorge. Looking for white rhinos in Ziwa Rhino Sanctuary. Visit the savannah parks Murchison Falls National Park, Queen Elizabeth National Park and Lake Mburo National Park. Game drives in the aforementioned parks and a memorable cruise on the Nile and the Kazinga Channel. Chance of 13 primate species in the tropical rainforests of Kibale National Park, Bwindi Impenetrable National Park and Mgahinga Gorilla National Park. Optional climbing of the famous Virunga volcanoes. Hundreds of species of birds, a true bird paradise. Single-Friendly! Singles pay the same price as those who travel in pairs; singles always have their own room or tent. Through our unique partnership with Nature Lodges and our own accommodation we can make this offer.